Many gardeners have been growing Heirloom Tomato varieties for years, they are not new, they can taste great if you choose the right variety, and they grow in the same conditions as modern hybrids. Some gardeners argue that they taste better, and this may be true, however any home grown tomato, heirloom or otherwise will taste better than a store bought one. Quickly becoming some of the most popular varieties grown in the Australian home garden Heirloom Tomatoes come in many varieties and you can grow them from seed. You can get cherry types, coloured varieties and type suited to salads as well as for saucing and preserving. But what are sort of plants are Heirloom Tomatoes? And are they the best type to grow ? These are plants that have been pollinated naturally, from two plants of the same type for many years, they come true to type, and are available for sale online as seeds or seedlings. They provide fruit with taste, that are easily grown in the home garden. Heirloom types have survived because of characteristics of taste and seedlings types such as ‘Black Russian’, Roma, Stupice, Riesentraube (picture right) and Mortgage Lifter are becoming available at specialist plant sales. 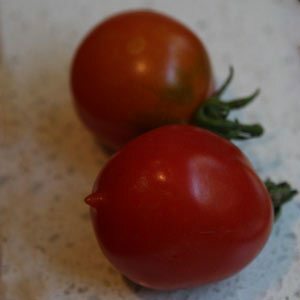 Tiny Tim and Tommy Toe are great smaller tomatoes. A plant that has been selectively hybridized for many years, original attempts were to develop more prolific fruiting varieties, better tasting fruit and disease resistant tomatoes. However with the need to have tomatoes that will fruit prolifically and that will also last for weeks in a supermarket many tomatoes have been bred for this characteristic rather than taste. While the hybrid types are generally grown for ‘shelf life’ and ‘large crops’ and heirloom types are usually grown for taste only a few new hybrids do meet the taste test, we provide a guide to some of the best tomatoes available to grow from seed or seedlings in the home garden. Easy to grow, great for sauces, a very versatile tomato. Another of our favorites, tall growing and tasty, can be picked as soon as the base begins to color and left to ripen indoors. Australian bred large heavy cropping plant. Very large ‘Beef steak’ type tomatoes, sweet rich flavor, great for slicing for sandwiches and salads. Early to mature and relatively low growing. Cherry tomatoes, sweet and a tall growing plant. Yes its very dark, with dark flesh, something a little different. Heirloom Tomato Seeds should be sown early in spring in a greenhouse, hothouse or cold frame to give protection from cold weather and late frosts. Sow seeds either in individual pots ( why not try biodegradable pots that can be planted directly into the ground) or into trays. You can use a removable poly tunnel and sow directly into the vegetable garden if you wish, but watch out for snails, they love seedlings. Tomato plants are best planted 1/2m apart. Find a sunny position, 7 -8 hours of sun a day is ideal. Look for low nitrogen fertilizers, to much nitrogen just encourages foliage growth. Keep tomato plants well watered. Large pots are good for tomatoes. More varieties to consider are the early ripening ‘snow white’ a small cherry type with yellow flesh and the late ripening ‘brandy wine’ which has excellent taste. One of the all time favourite tomatoes is Mortgage Lifter. Lots of stories about where it came from, how the mortgage was paid off and what great tomatoes they are. A number of types or ‘varieties’ are around, however in essence this is a ‘beefsteak’ heavy producing type that has good taste.